Fears that the European Central Bank (ECB) will turn off its money-printing machines sent investors across the region rushing for the exit yesterday. 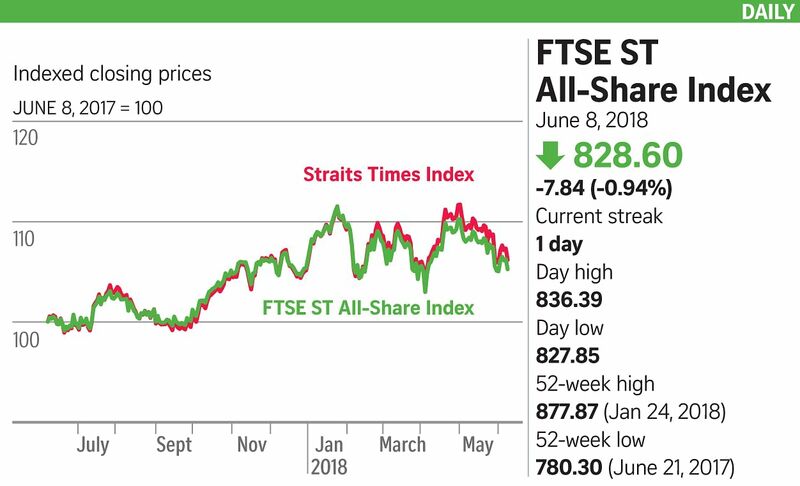 The retreat left the Straits Times Index (STI) down 36.71 points, or 1.06 per cent, to 3,436.37 - up just 0.3 per cent for the week. About two billion shares worth $1.1 billion were traded, with losers outpacing gainers 264 to 151. It was much the same elsewhere, with a sea of red across the region, from Japan and Hong Kong to Taiwan, India, Australia and Malaysia. The main damage to the STI came from the banks and the Jardine stable. OCBC was down 26 cents to $12.58, United Overseas Bank fell 54 cents to $28.02, and DBS retreated 30 cents to $28.50. Jardine Cycle & Carriage was in the red as well, slumping 48 cents to $34.52. Jardine Matheson lost 28 US cents to reach US$62.41. Negative news also played a part with ComfortDelGro. It lost six cents, or 2.4 per cent, to $2.40 after OCBC Investment Research downgraded its call to "hold". It said it wanted more clarity on the taxi operator's plans to enter the private-hire car space, noting that new competitors are also looking to crack the market dominated by Grab since Uber's departure. Industry watchers put yesterday's market performance down to recent talk that the ECB might be preparing to withdraw its quantitative easing programme. Almost a third of the respondents in a Bloomberg survey of economists predicted that the bank would set an end-date for purchases after next week's gathering of the Governing Council, while 46 per cent said it would be done at the session next month. The trade skirmishes were never far from investors' minds either. A remisier noted yesterday: "The trade war talks are still going on, but until you get real specifics, I don't think the market knows how to react. "The other thing is the World Cup. It's actually true - every World Cup, it is like that. Volumes die down as brokers and clients shift their attention, and punters shift their funds too." Meanwhile, traders expect few ripples out of the Group of Seven meeting this weekend. Mr Freddy Lim, chief investment officer at StashAway, an automated digital wealth manager, said: "This will be tense but we expect little market impact." Many countries have threatened retaliation on United States' tariffs. However, the markets have brushed this aside and continued to reach new highs, he said.